Hello, dere! The state of Ohio has a very rich history when it comes to Horror Hosts with names like Dr. Creep, Ghoulardi and The Cool Ghoul leading the way. 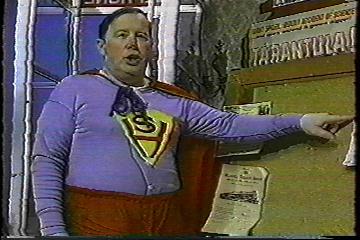 Also at the top of that list is Cleveland’s very own superhero, Superhost! It’s amazing to think that the world of Horror Hosts is filled with lots of mad doctors, vampires and ghouls but only two Superhero ones that come to mind are Commander USA and Superhost, both of whom delivered lots of laughs alongside the movies they hosted. 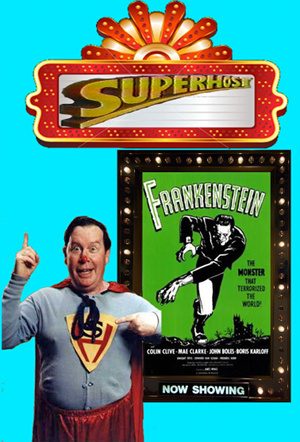 When selecting hosts to cover this year, I knew that I had to cover Superhost as he is a true legend in the world of Horror Hosting and is a true icon of funny fright here in Ohio. So join me on this Horror Host Icon update as we take a heroic look at the one and only Superhost! 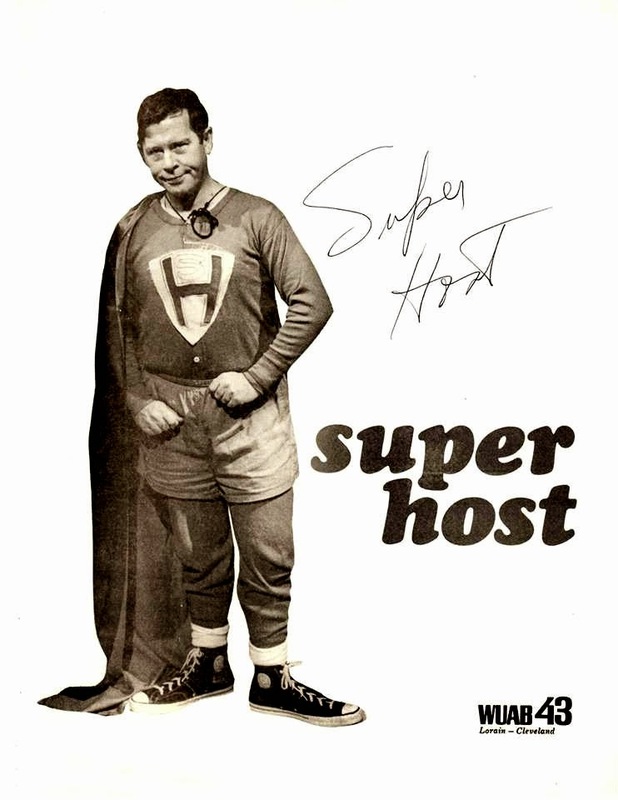 Superhost began his hosting career on WUAB Channel 43 in Cleveland, Ohio in 1969 and hosted back to back shows for much of his career with “Supe’s On!” being the pre-show that lasted an hour and would show “Three Stooges” and “Laurel And Hardy” shorts and would later show TV Shows like “The Munsters.” And then he would host his main show called “Mad Theater” that would have Superhost hosting two back to back films and later one film for the viewers at home. His shows would air on Saturday Mornings and was a great way for Monster Kids of the late 60’s-80’s to enjoy classic horror and comedy. 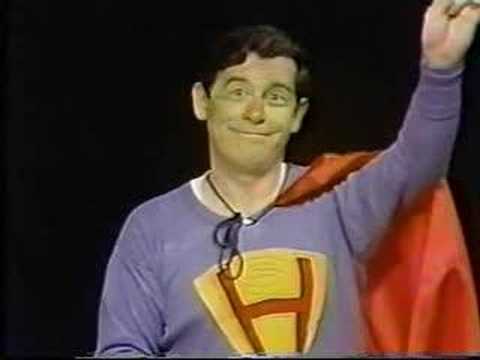 Superhost would greet his viewers with his classic catch phrase “Hello, Dere”and would entertain them with his silly humor and even more goofy skits that would be parodies of famous TV Shows and people. 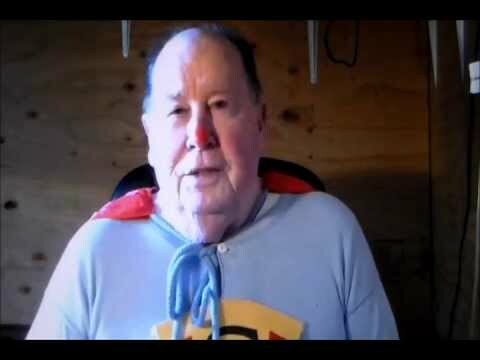 Superhost was a fun loving kind of hero who wore a baggy light blue outfit that had his classic SH emblem on it, red boxer shorts, a large red cape. He had a red nose and seemed to enjoy bringing the movies to the viewers even sometimes taking jabs at the films’ quality and budget. Superhost’s set was mostly in front of a movie theater (called Superhost Theatre) that had glowing lights and the movie(s) or shows’ title on the marquee. With TV growing and the popularity of syndicated shows like Pro Wrestling, Mad Theater went through lots of changes shortening its run time and even changing its format but Cleveland’s favorite Host lasted on air until 1989 giving him a very great 20 year run on the air. During this time, he made public appearances and even appeared on other Horror Host Shows like “Hoolihan & Big Chuck” who also were iconic Horror Hosts from Cleveland on the rival network. 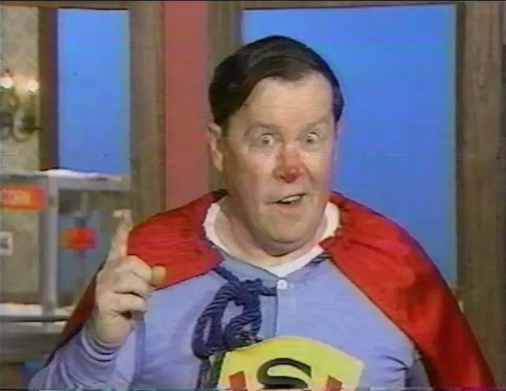 Say what you will but Superhost is truly an icon of Ohio TV and his popularity lives on thanks to fans who trade his shows and chat about his silly ways! 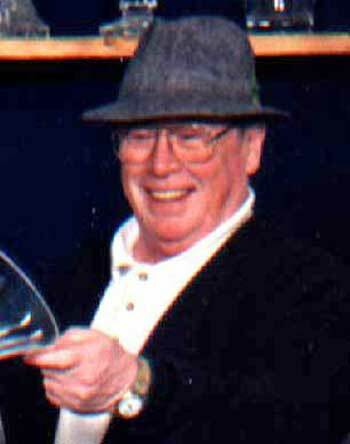 Marty Sullivan is the man behind Superhost and was born in Detroit, Michigan on March 1, 1932 of Irish decent. Before he was on Cleveland airwaves, he survived in the Navy, went to college and worked a little a little as a radio newscaster. But he really made a name for himself on WUAB Channel 43 and not just for being Superhost as he also was the floor director and staff announcer and fill in movie host for the show “Prize Movie” and did that up until 1993 as well as did the news breaks from time to time for the station. He also had a background in radio and was really a jack of all trades when it came to media. Marty was inducted into the Ohio Broadcasters Hall Of Fame in 1991 and is still very much respected for all his hard work at WUAB. 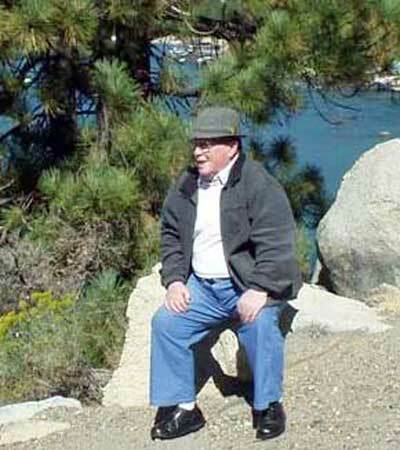 Marty is 86 years old at the time of this update and has long been retired from the world of broadcasting and is enjoying his days living in Oregon, chatting with fans who grew up watching him as the one and only Superhost. 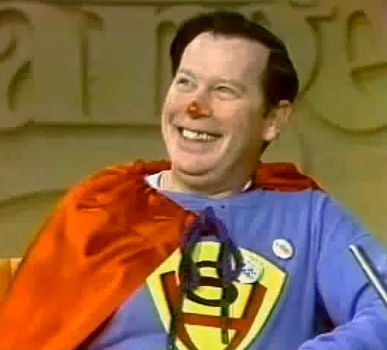 And for those wondering, yes, he does dress as Superhost from time to time for interviews and skits that appear on TV, but these appearances are very far and few. The year was 2015, and the place was Horrorhound Weekend. The event was the Horror Host Hall Of Fame and in this class Superhost was long overdue to be inducted! The honor of inducting Superhost went to Dayton, Ohio Horror Host Baron Von Porkchop who told me he was extremely honored to have been asked to do so, and he did all his research and watched many of Superhosts skits and shows and did a fantastic job of honoring a Host legend that paved the way for him and many others who followed. It was amazing to be in the crowd watching a Host I created inducting a super iconic Host from our home state and hearing people cheer as Superhost was officially added in and many of his fellow peers and fans witnessing this special moment. The only let down is that I wished Marty Sullivan could have made it and accepted his award as it would have been an honor to have met him in person. So if your reading this, Superhost, I hope that you enjoyed Baron Von Porkchop’s speech as it was our pleasure to pay you the respect that you deserve. The strangest thing about Superhost for me is I cannot remember how I first heard about him, but I feel like I have known about him for many years including when I was a teenager. I am going to guess I had to have read about him in a magazine, newspaper or saw him on the news or even heard about him from some of my Horror Host friends. One thing is for sure, once I was able to track down episodes of his show I was all over them as he is considered a Horror Host legend here in Ohio and I had to see him in action. From day one I was not disappointed as it seemed to me that he was having a blast doing the show, and I could see how viewers at the time made it must see television. Superhost is a real master of the Horror Hosting craft as he talked to the viewers and made watchers feel like they were his friend. He would poke fun at himself as well as the night’s movies doing what he had to do to get them to laugh. 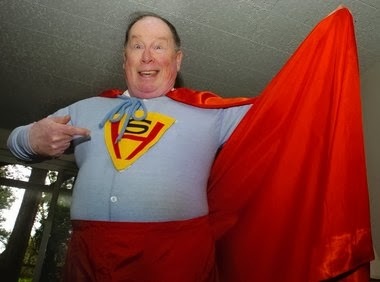 It’s a shame that Superhost never made it to the world of comic books as he would make for an amazing all ages comic character…someone should do this….maybe Sparkle Comics could do a comic one shot about his silly adventures one day. 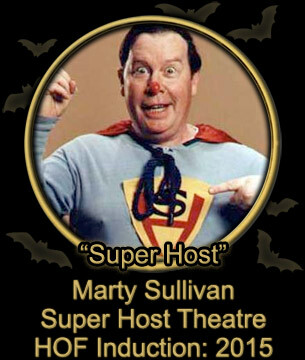 But one thing is for sure, Superhost is well respected among Ohio fans and fellow Horror Hosts coast to coast. Here is to you Marty Sullivan for being a true icon in the world of Horror Hosting. So its that time when the Sups Is On and we need to take a look at episodes I own of Superhost with many of these episodes coming from Trade Lists and friends like James and Darren who made this update even better with episodes they have sent me. I do not give these episodes a star rating and the host segments are written by me with the films coming from our pals at IMDB. So lets watch some Horror Flicks with the one and only hero of TV Superhost! Oh and to keep it easy I am just going to call all episodes Mad Theater to keep it simple. I also want to say I did have a DVD called Superbits that featured moments from the show but decided to leave it off of the review. Host: Superhost reads fan mail about getting his show and they are all made up and silly and then he promises that later in the show he will have big name guests, and then ushers us into the movie! Superhost comes back and chats with Herman Pincher, an expert in crabs, and the interview goes bad as Herman is crazy and thinks he is on the Tonight Show. All the while we are treated to cheesy Superhost bumpers where he always welcomes us back to the night’s film. At one point Superhost eats some crabs and says that’s how they should have dealt with the crab monsters from the nights movie. After the movie Superhost changes out of his costume and ends the show. Movie: A group of scientists travel to a remote island to study the effects of nuclear weapons tests, only to get stranded when their airplane explodes. The team soon discovers that the island has been taken over by crabs that have mutated into enormous, intelligent monsters. To add to their problems, the island is slowly sinking into the ocean. Will any of them manage to escape? Note from Matt: This appears to be a fan reproduction of the episode and is missing all commercials. Host: Superhost opens the show giving us a few facts about Frankenstein and shows off some drawings of The Monster that were sent to him before going to the movie. Next up Superhost shares some local events that are happing around town like plays, festivals, haunted houses and fish fries! And his announcements for the community events lasts break after break and he does so with grace and charm. And sadly his final bumper is missing from this episode. 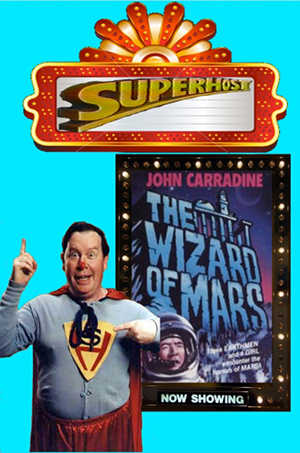 Host: Superhost tells a few fun facts about the night’s movie and tells the viewers that it’s a really good movie! And sadly that’s all we get to see of Superhost from this episode as the person who recorded it removed his segments and the commercials. Movie: After their luxury cabin cruiser crashes on a reef, Bob Rainsford finds himself washed ashore on a remote island. He finds a fortress-like house and the owner, Count Zaroff, seems to be quite welcoming. Apart from Zaroff’s servant Ivan, the only other people present are Eve Trowbridge and her brother Martin, also survivors of their own shipwreck. Other survivors are missing however and Rainsford soon learns why. Zaroff releases them into his jungle island and then hunts them down in his grisly “outdoor chess” game! Then after Martin disappears, Bob realizes that he and Eve are to be the next “pawns” in Zaroff’s deadly game. Note from Matt: It’s always a shame when an episode of a Horror Host program is uncovered and who ever recorded it removes all or even some of the Host segments. Just really makes you wonder what Superhost did in this episode. Host: Superhost starts with reading a letter that had a triva question and gives the answers. The film is the second feature of the day, and he gives us quick little facts about it and rushes us to the movie. 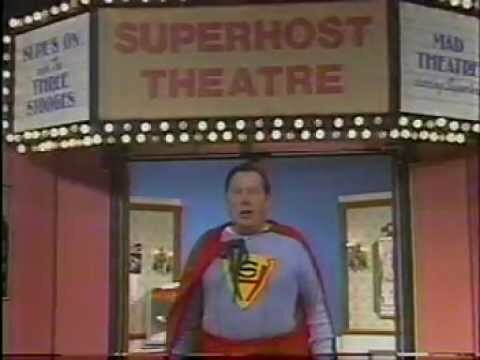 Superhost welcomes us back to the show after a break but does say to us viewers that it’s a great day outside and that kids should be outside playing, but also make sure to say or stay in and watch the movie. We next join Superhost as he reads off some local events that are going on in the coming weeks, and so he does for a few more breaks. Superhost then closes the show and tells the viewers that next on is King Kong and wonders why his boss didn’t give him that to host. Movie: In 1974, four astronauts, silver shoe-clad Dorothy, overweight Doc, goofy Charlie, and wooden Steve, crash land on Mars when taking readings, with only four days of supplies. They must try to survive on the surface, which is barren except for some canals with huge maggots with fins. After embarking through a golden igneous cavern, braving a storm and finding an unmanned Earth vessel, they discover a golden road which leads them to the unchanging ruins of what was once a beautiful Martian city. The Martians are modeled on the Flatheads of Oz, and their collective consciousness, the “Wizard,” forbids them to leave until they perform a very small task. 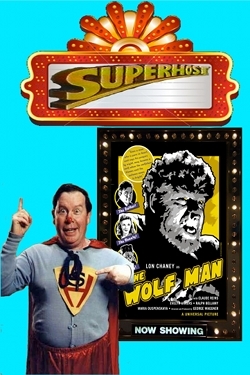 Host: Superhost starts the show off by reading a letter from a fan who sends his list of favorite Horror Movies and on that list is The Wolf Man that happens to be the day’s film! We next join Superhost as he says alerts us to some local events happening and shows us a drawing a fan did of Frankenstein’s Monster! And when we see him again Superhost must spend more time telling us about events going on around Halloween, and this goes on for a few more breaks. And sadly his final break is missing from the episode. Movie: Upon the death of his brother, Larry Talbot returns from America to his ancestral home in Wales. He visits a gypsy camp with village girl Jenny Williams, who is attacked by Bela, a gypsy who has turned into a werewolf. Larry kills the werewolf but is bitten during the fight. Bela’s mother tells him that this will cause him to become a werewolf at each full moon. Larry confesses his plight to his unbelieving father, Sir John, who then joins the villagers in a hunt for the wolf. Transformed by the full moon, Larry heads for the forest and a fateful meeting with both Sir John and Gwen Conliffe. Superhost really is a great Horror Host and really has inspired many creative people from the Cleveland, Ohio area and beyond. 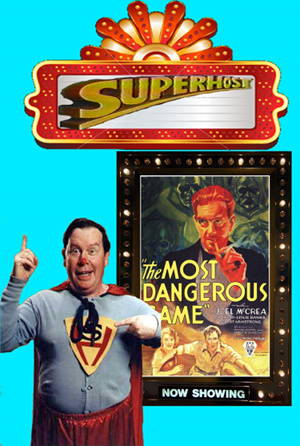 Superhost has a friendly and calming voice that made the viewers feel like one of his close friends. 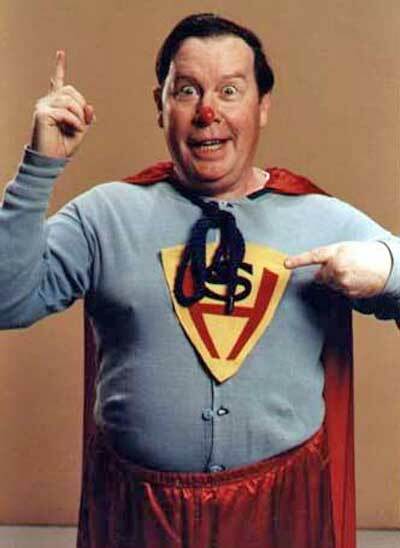 And what shows that Superhost was such a great Host with a great show is the fact he lasted on air for two decades and is ranked as one of Cleveland’s top Hosts and ranks up with the likes of Ghoulardi, The Ghoul, Son Of Ghoul, Big Chuck & Little John and Mad Daddy to name a few. So to sum it all up, Superhost is a true Icon in the world of Horror Hosting and deserved to be inducted into the Horror Host Hall Of Fame! But sadly for our next update we must leave the world of Horror Hosting behind and travel to the world of Bones! Yep we will be talking an epic journey with Malibu Comics and their series simple called Bones. So until next time, read a comic or three, watch a Horror Movie or two and as always support your local Horror Host! See you soon for an adventure with a skeleton hero!